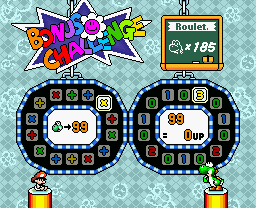 Roulette is a Bonus Challenge that involves luck in Super Mario World 2: Yoshi's Island, its remake for the Game Boy Advance, Yoshi's Island: Super Mario Advance 3, and its sequel, Yoshi's Island DS. Players place a bet on how many lives they wager on the middle of the first circle up to a maximum of ninety-nine, and then the two circles have a light that will rotate. One of the circles counts as the equation, which will either be addition or multiplication, while the other one contains numbers ranging from 0-3. In multiplication, if it is a "x2" or a "x3", then players can double or triple the number of lives. The player cannot bet with their last life. Players get the set number of lives depending on the equation. For example, the player may bet fifteen lives, and the two circles land on X and the "3", they get 45 extra lives (15 x 3 = 45), which are displayed on the middle of the second circle. This gives the player 30 extra lives when the 15 lives entered is taken into consideration. Or the player bets the maximum of ninety nine lives, and the circles land on "X" and the "3", the player gets 297 extra lives (99 x 3 = 297). The Bonus Challenge will immediately end if the second circle ends with zero and the multiplication sign is in the first one. This page was last edited on March 2, 2018, at 19:52.